Anthony MacAulay, Notary Public; serving Parksville & Qualicum Beach to provide professional and personalized advice and service to local families and small business. In addition to Mortgage Refinancing services, Notaries also provide the following services, among others. 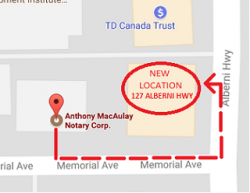 We have moved to 127 Alberni Hwy. It’s just around the corner from our previous location.